Orange’s Zach Harrison (13) hauls in a touchdown in front of Olentangy’s D’Ante Ables during the first half of Friday’s key OCC clash in Lewis Center. Each of the last two years, the difference between the Olentangy and Olentangy Orange football teams has been razor thin. Friday night was no different. 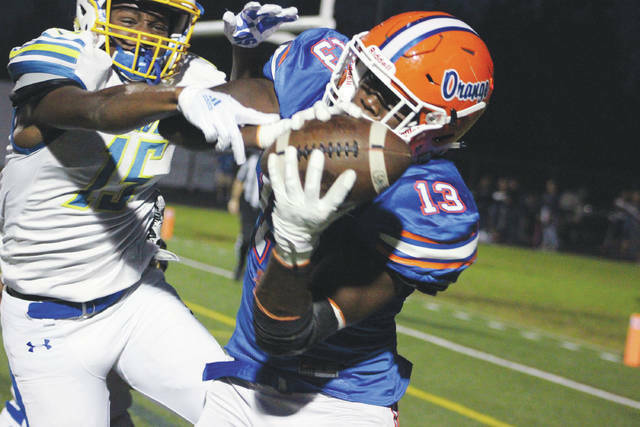 The crosstown clash came down to a missed two-point conversion in overtime to give visiting Olentangy its first victory over rival Orange in two seasons – a 35-34 win in Lewis Center. “After all this time – to put the work in and then come through and get the dub tonight … it’s just special,” senior D’Ante Ables said. And as coach Mark Solis pointed out after the game, Olentangy is right in the thick of it in the OCC-Buckeye and still alive for a fifth consecutive playoff bid. Zane Lattig caught a 25-yard touchdown pass from Robbie Dayhuff on Orange’s first offensive play in overtime to set up the two-point conversion. Orange tried to win it with a two-point conversion, but Dayhuff’s screen pass to Zach Harrison fell incomplete. Solis wasn’t second-guessing Schroeder’s decision to go for two. Ian Drummond, who had a 12-yard touchdown reception in the second quarter, caught a 19-yard fade down the right sideline to convert a third-and-12 in overtime. Zach Shiblaq scored on the next play and Brady Pethtel booted through what turned out to be the difference-maker. Ables blocked a field goal at the end of regulation to help Olentangy send it to overtime. Riedel was at the center of big play after big play for Olentangy. He returned a kickoff 88 yards for a touchdown in the second quarter to tie the game 7-7 after Harrison won a jump ball for a 5-yard touchdown. Riedel deflected a Dayhuff deep ball over the middle into the hands of teammate Max Walden for an interception later in the frame. He was also on the other end of a big play. Olentangy quarterback Connor Haag found him on the left sideline on a quick pass. But, Orange’s Mitchell Gifford took the ball away from him on the tackle and returned it 43 yards for a touchdown to give Orange a 21-14 lead with 27 seconds left before the break. Riedel responded well. He caught an 11-yard touchdown pass from Haag on Olentangy’s first possession of the second half to tie it 21-all. Dayhuff took a quarterback draw 37 yards down the left sideline to set up a Jake Vanchieri 2-yard touchdown to give the Pioneers the lead again. Then, Riedel had a 16-yard run before Haag found Caden Kaiser to convert a fourth down to get into the Orange red zone. That’s when Gifford came up with his second fumble recovery. He picked up a bad exchange at the five to keep the Pioneers in front. After the teams exchanged possessions, Kaiser caught a Haag ball over the middle and turned it into a 62-yard pass play to set up Shiblaq’s 1-yard touchdown to tie it at 28-28 with 6:07 left in regulation. Orange had the ball until the end of regulation – using another Harrison jump ball catch for a 25-yard gain to get inside the 10 to set up Aidan Hill’s go-ahead field goal try with seconds left. Haag went 12-for-17 for 146 yards and two touchdowns and Shiblaq had 94 yards rushing on 21 carries, two for touchdowns to lead Olentangy (3-4, 2-0). Dayhuff finished 16-for-22 for 174 yards and three touchdowns through the air and added a team-high 88 yards on 17 carries on the ground to lead the Pioneers (4-3, 1-1). Sam Wynn had two catches for 60 yards, including a 48-yard touchdown reception in the second quarter. Both teams continue league play next week. Olentangy travels to rival Olentangy Liberty and Orange visits Westerville Central. Both are scheduled to kick off at 7 p.m.